06/27/2016: We won 4 tickets to a sneak preview and loved it! The new trailer was released for Tarzan 2016 last week…hubba hubba!!! We’re excited to see this! It opens July 1, 2016! It has been years since the man once known as Tarzan (Alexander Skarsgård) left the jungles of Africa behind for an aristocratic life in London as John Clayton, 3rd Viscount Greystoke, with his beloved wife, Jane Porter (Margot Robbie) at his side. Now, he has been invited back to the Congo Free State to serve as a trade emissary of the House of Commons, unaware that he is a pawn in a deadly convergence of greed and revenge, masterminded by the corrupt Belgian Captain Léon Rom (Christoph Waltz). This is a modern-day live-action big-budget feature! The principal photography on the film commenced on June 30, 2014, at Warner Bros. Studios in Leavesden, Hertfordshire, UK. The filming wrapped-up on October 3, 2014. Caroline saw DiVine every day while working at Discovery Island. Hands down, one of the coolest characters at the Animal Kingdom is DiVine. While Caroline was working at DAK, she would see her on most days, usually between 10am-2pm, on the pathway between Africa and Asia. 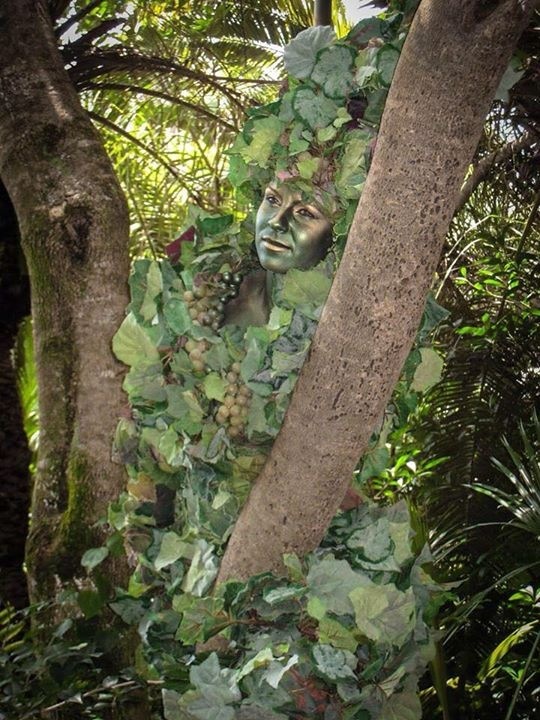 She’s painted green, walks on stilts, and is wrapped in leaves, ivy, and grapes to camouflage herself into the rest of the park’s foliage. She’s almost 7 feet tall! While working, DiVine would come walking by Discovery Island and everyone would just stop and stare. She’s is on stilts so her height can vary between 7 feet to 16 feet depending on what she is doing with her hands and legs. DiVine in motion, walking around DAK. 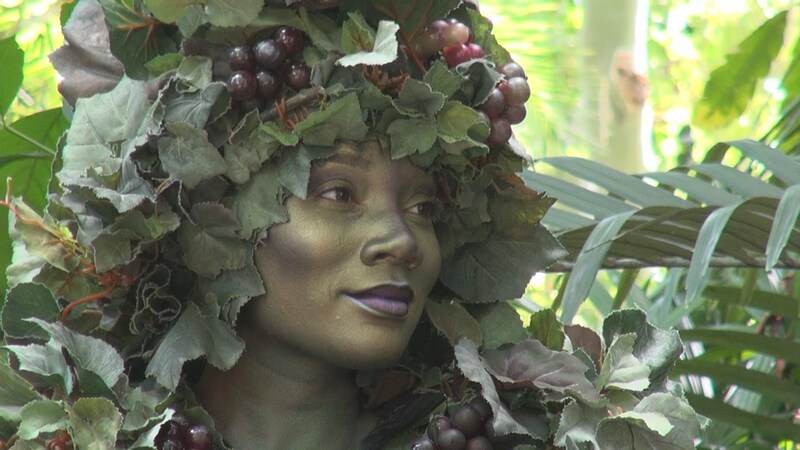 Hands down, we think one of the coolest characters at the Animal Kingdom is DiVine! She is hard to see when she’s not moving and her eyes are closed! Caroline working at DAK’s Discovery Island (merchandise). Finding Dory – Opens June 17, 2016! The new movie trailer for Finding Dory was released today! It looks so cute! The new movie trailer is out….so cute!!! Finding Dory is about the amnesiac blue tang fish, Dory, as she tries to reunite with her family. The film takes place six months after the events of ‘Finding Nemo’ (which opened in 2003) and is set off the coast of California. The main characters from the first film are appearing in the sequel, including Dory, Nemo, Marlin and the “Tank Gang” from the dentist’s office. The 3D computer-animated comedy adventure film is produced by Pixar Animation Studios and released by Walt Disney Pictures. And, the Pixar short before the movie, Piper, is adorable!!! So cute! Makes us miss the beach!!! 05/14/2016: Eleven people were hurt Saturday afternoon in a wrong-way, head-on collision near Walt Disney World’s Animal Kingdom, the Florida Highway Patrol said. Both vehicles were totally destroyed in the fire. Troopers say the driver of the SUV, identified as 36-year-old Megan Hester-Villalobos, of Groveland, was headed south in the northbound lanes of Sherbeth Road and hit the bus. A fire erupted, destroying both vehicles. Thick black smoke from accident could be seen for miles and from all the parks. Video from an onlooker shows flames and thick smoke billowing from the crash site and the ensuing clamor as first responders raced toward the scene. The driver, an adult male passenger and a child were inside the SUV and were all taken to a hospital. Luckily, no one was killed. The speed limit on that road is 25 mph. Eight of 16 people from the bus were also taken to a hospital. All were Disney cast members on their way to work. “Okay, to clear any misunderstandings or confusion about the J bus accident, I have the story. It wasn’t the bus driver’s fault at all. I was in the accident and it was the scariest moment of my life (and I’m sure others). A woman came straight at us in our lane (I’m assuming she was texting and driving, but not sure) and I saw the head-on collision… That car was smashed like an accordion in the front and the windshield was smashed in as well – airbags out. Talk about “life flashing before your eyes” moment right there. Flames started in the engine of that car which caused the J bus to go up in flames as well. There were 15 of us on the CP bus and 8 were sent to the hospital. Majority of us were all thrown from our seats onto the floor and received either emotional scarring and/or physical injuries. The bus driver was amazing. Absolutely great, positive, calm, encouraging. He was then sent to the hospital after an hour or two once he could feel his injuries after the adrenaline stopped (along with others). Our bus went completely in flames and some of us lost everything we had with us on the bus – money, IDs, personal items, etc. The family that hit us were also sent to the hospital and they’re in more serious condition then us. Please keep everyone in your prayers, tonight. A woman who allegedly fell asleep at the wheel of a SUV could be facing charges after she crashed into a Disney shuttle bus on Sherberth Road, near Animal Kingdom, on Saturday. Authorities believe Megan Hester-Villalobos, of Groveland, fell asleep at the wheel after spending the day at a Disney park. The trooper who interviewed the boy was impressed with the child’s recollection of the crash, stating that he has a good memory, was articulate and very specific. The collision resulted in both the SUV and the bus bursting into flames. Troopers said eight passengers on the Disney shuttle bus suffered relatively minor injuries. Hester-Villalobos and her husband suffered serious injuries. The 7-year-old boy was also injured but has been released from the hospital. “It was a very severe crash. We are very lucky that bystanders helped the mother and father out of the car, because both vehicles caught on fire,” Montes said. Troopers do not feel Hester-Villalobos was impaired, but said she is facing the charge of traveling on the wrong side of the road. The FHP said nine crashes have happened in the past 1½ years in the area near where Saturday’s incident happened. “The road is a very curvy road, and if you are not paying attention, it could (be) easy to get on the wrong side of the road or to get out of your lane,” Montes said. Troopers plan to interview the boy’s mother to get her side of the story, but are giving her some time to recover from her injuries. Hester-Villalobos has been ticketed at least five times in Lake County since 2009, court records show. She was arrested in August on retail theft charges and was sentenced to 90 days in jail. A judge also ordered her drivers license be suspended six months and she pay more than $150 in restitution as punishment for the theft charge. She’s also the daughter of Groveland’s former City Manager Ralph Hester. In 2009, she called her father complaining she’d been pulled over and ticketed after running a red light and driving 23 miles over the posted speed limit. She and her father then accused the officer of targeting them because he’d tightened budgets in the aftermath of the economic downturn. Hester-Villalobos told her father the officer was rude and intimidating. She fought the ticket and a judge dismissed it, court records show. Ralph Hester died later that year. And, just last night, 2 DCP buses caught fire at Vista Way. No one was injured. March 11, 2018: Two buses on fire last night! During our program, buses caught fire too! DCP Bus on Fire! Beginning Saturday (05/14/16), Disney Dollars, a popular souvenir item and the in-house currency at US Disney parks, will no longer be sold. Disney confirmed in a statement on Thursday that the once popular currency, which could only be used at Disneyland and Walt Disney World, would be terminated effective Saturday. We loved getting Disney Dollars as kids! The Disney Dollars currently in circulation can still be used. Gift cards and and debit cards made the Disney Dollars obsolete. Disneyland’s first president, Jack Lindquist, invented Disney Dollars because of the Anaheim and Orlando theme park’s growing popularity in the mid-1980s. The first dollar runs were unveiled and circulated on May 5, 1987. Disney Dollars featured pictures of Mickey Mouse, Donald Duck and other characters. They were sold at the theme parks in denominations of $1, $5, $10, $20 and $50. Disney Dollars were produced with the same level of “care and concern as any other currency,” Lindquist said. We loved our Disney Dollars and have several from our early trips to WDW in the 1990s. During our DCP programs, we both noticed how rare the Disney Dollars had become. We rarely saw them being used to purchase merchandise. Previously, parents would give their kids $10-$20 in Disney Dollars when they got to the parks to spend on daily snacks and souvenirs. Now, they just give them pre-loaded Disney gift cards for each day. Disney Dollars have gone the way of purchasing Kodak photo film for your camera on Main Street USA. Special Disney Dollars were issued for the 20th anniversary in 2007. The Disney Look for every role. At WDW and Disneyland, Disney Cast Members are famous for their friendly, classic appearance. This look is not a coincidence, but a result of cast members’ support of the Disney Appearance Standards or, as it’s called, the ‘Disney Look’. All of these hairstyles are the Disney Look. Hair should be neatly combed and arranged in a classic, easy-to-maintain style. Extreme styles are not permitted. Hair below shoulder length should be confined if it falls forward over the face while working. Conservative braided hairstyles without beads or ornamentation are permitted. Hair products may be used to create a soft, natural hairstyle within these guidelines. Shaving of the head or any portion of the head or eyebrows is not permitted. Artificial hair is permitted if it looks natural and meets all of the above requirements. The Disney Look does not permit extremes in dyeing, bleaching or coloring. If the hair color is changed, it must be natural-looking and well maintained. Subtle highlighting or frosting is permitted as long as it creates a uniform look over the whole head and meets all of the previously listed guidelines. Body modification is not allowed for male or female Cast Members. Hair must be neatly cut on the back and sides, forming a smooth, symmetrical appearance so that it does not extend beyond or cover any part of the ears or the shirt collar. The overall style must be neat, natural and balanced proportionally. A shaved head is permitted, as well as a very short military-style cut. Shaving of the eyebrows is not permitted. Conservative braided hairstyles for men without beads or ornamentation are permitted. They must be styled above the ears and cut above the collar and be neatly braided close to the scalp in straight rows. Tucking hair behind the ears, or pinning or tucking it under a hat to conceal an unacceptable hairstyle will not be permitted. Extreme or bi-level styles are not permitted. Mullets and messy hair are not allowed at work. The Disney Look does not permit extremes in dyeing, bleaching or coloring. If hair color is changed, it must be natural-looking and well maintained. Subtle highlighting or frosting is permitted as long as it creates a uniform look over the whole head and meets all of the previously listed guidelines. For all Male Cast Members, a fully grown in, well-maintained mustache, beard, or goatee is permitted, unless otherwise restricted by regulatory codes and standards. Facial hair must be neatly trimmed and may not present an unkempt appearance. Extreme styles are prohibited. All facial hair (beards, goatees and mustaches) must create an overall neat, polished and professional look. All facial hair must be fully grown in, neatly groomed and well maintained at no longer than a quarter of an inch in length. Mustaches may extend below the corners of the mouth to meet with the facial beard. Shaping the mustache or beard to a particular style is not permitted. Mustaches (without lower facial hair) must not extend onto or over the upper lip and must extend to the corners of the mouth, but not beyond or below the corners. Cast Members without a mustache, beard, or goatee are expected to be clean-shaven every day. For clarification on whether a mustache, beard or goatee is acceptable, please consult your area leader or contact the Cast Image and Appearance team. Sideburns must be conservative and neat. Sideburns should be neatly trimmed, straight and even in width, and are permitted to extend to the bottom of the earlobe. They should blend naturally from the hairline and from the length of hair on the head. Flares or muttonchops are not permitted. Nope, not the Disney Look. DHS’s Earful Tower is Gone! My last photo of the Earful Tower that I took earlier this year. Disney announced back in January 2016 that DHS’s iconic Earful Tower would be torn down as part of the plan to redevelop the park. At one time, the Earful Tower served as the main icon for what was then known as Disney MGM Studios in the 1990s. It was in place when Disney MGM Studios opened on May 1, 1989 and through the years the tower saw décor come and go. Decorated for the 101 Dalmatians movie premier. The Earful Tower was removed overnight after park closing last Friday night (April 29, 2016). The area of land that the tower occupied will soon be home to the new Toy Story Land. Major construction at DHS continues on a new Star Wars-themed Land and new Toy Story Land, both opening in 2017. The new Disney Springs water tower. In January 2016, is was rumored that the Earful Tower might be moved to Disney Springs, but then a new, different style water tower was installed at Disney Springs in February. All the Earful Tower merchandise is gone from the shops.